Dana aircraft from Abuja to Port Harcourt has overshot the runway on landing at the Port-Harcourt international airport, Omegwa, reports ITRealms. The forty-nine passengers on board, ITRealms gathered, were successfully evacuated without any injuries or casualty. Confirming this, the General Manager, Public Affairs at the Federal Airports Authority of Nigeria (FAAN), Mrs. Henrietta Yakubu, said the runway at the airport has been closed, but soon will be re-opened after the necessary work had been done to ensure the runway is save for other flights to come in. She also said the incident was suspected to have been caused by a heavy rain, which was accompanied by strong wind and storm in Port Harcourt axis. “No casualty was recorded, as all passengers on board were safely evacuated,” she declared. Of late, Dana has been in the eye of storm over air mishaps, especially in the past few weeks. 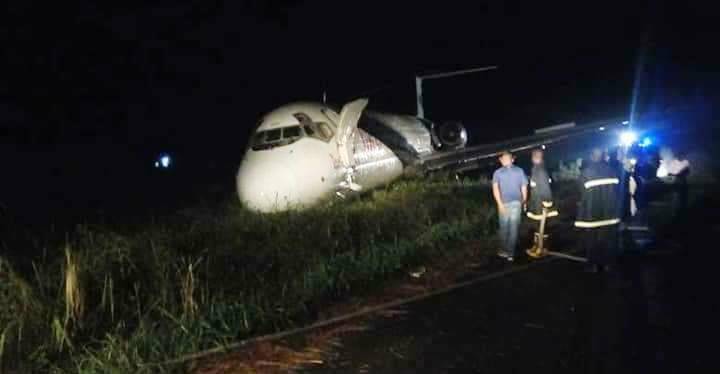 Though the airline alleged an apprehensive passenger tinkered with the emergency exit while the plan still on the runway, alternate report showed there was no passengers at that particular exit to support the airline’s claim.